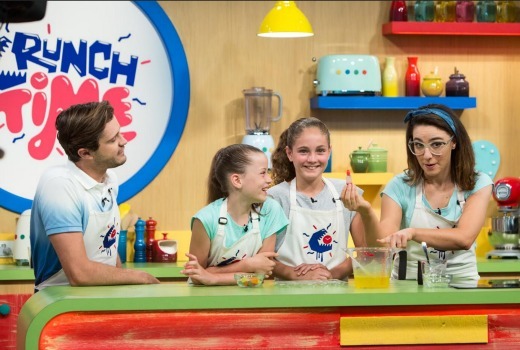 Crunch Time, a new kids lifestyle show, begins on GO! on Monday. Offering “wild antics, fun facts and valuable lessons in health and exercise,” the series is hosted by Alice Zaslavsky (MasterChef Australia, Kitchen Whiz) and Nick Vindin (Move It, SBS World News). With challenges, healthy recipes at home, backyard activities, physical stunts, it features young guests in each episode who have a special talent to show off: from hip hop dancing and violin to table-tennis. The series also has kitchen sponsors, but it’s unclear they will be featured in segments or product placement. If it’s the kind of show I think it will be, it seems like the sort which most kids would actively avoid.